Liberal Democrat Maxine Waters is practically a California institution. The almost 80 year-old politician has been serving since 1991, enacting more and more liberal policies in California, and it seems that there has never been a challenger capable of taking her down. But is that about to change? 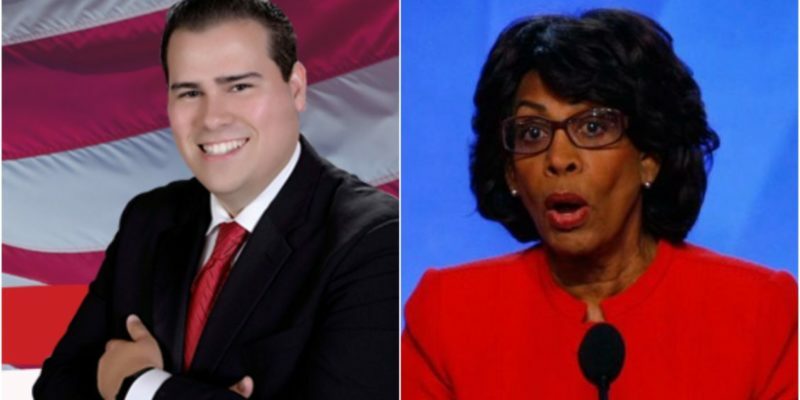 Newcomer Omar Navarro is a conservative Latino politician and he’s officially looking to send Waters packing once and for all. The 28 year-old rising star said that he’s had “enough” of seeing Waters and her liberal agenda destroy his state and he’s hoping to take her seat in the 43rd Congressional District in the 2018 elections. The 43rd District, where Navarro is running, includes parts of South Central L.A., Westchester, Playa Del Rey, Torrance, Gardena, Hawthorne, Inglewood and Lawndale. He was born in Inglewood and raised in Hawthorne and Torrance, which he says gives him an edge — because he knows the district and its people. He previously served on the traffic commission in Torrance. Do you support Omar Navarro?